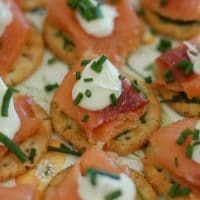 Gluten free crackers topped with cucumbers, smoked salmon, and chive crème fraîche make a great hors d’oeuvres or appetizer for any cocktail party or event. I received free samples of Breton Gluten Free Original with Flax and Breton Gluten Free Herb and Garlic from Dare Foods Incorporated mentioned in this post. By posting this recipe I am entering a recipe contest sponsored by Dare Foods Incorporated and am eligible to win prizes associated with the contest. I was not compensated for my time. This May, in honor of Celiac Disease Awareness Month, the Recipe ReDux team and Dare Foods teamed up to help spread the word about Dare’s newest line of crackers, Breton Gluten Free Original with Flax and Breton Gluten Free Herb and Garlic. If you’re familiar with the other Breton cracker varieties, you know they are light, crispy, are made with wholesome grains, and come in a variety of flavors. They make for a delicious snack or appetizer when paired with cheese, nut butters, or any other dip of choice. But for people with celiac disease or other food allergies and intolerances, the Breton line of crackers have been off limits. Until now! The newest Breton cracker flavors are gluten-free and contain the wonderful taste and texture profiles of the original crackers. The Breton Gluten Free Original with Flax and Gluten Free Herb and Garlic varieties are tender-crisp, full of flavor, and perfect for pairing with other ingredients when entertaining gluten-free guests. This past weekend I hosted a brunch for some family, including a cousin who has celiac. So what better time to put the Breton gluten free crackers to use. In addition to other gluten free dishes like a quinoa salad and gluten free quiche, I made these Nutritioulicious salmon cucumber bites using both varieties of Breton gluten free crackers as a base. Salmon cucumber bites are actually one of my favorite hors d’ourves to make for cocktail parties and events because they are very easy to assemble, low in calories, and have a pretty presentation. Sometimes I make them without a cracker base (like this), which is gluten free too, but the crackers add a nice crunch and flavor and make for a more filling appetizer. 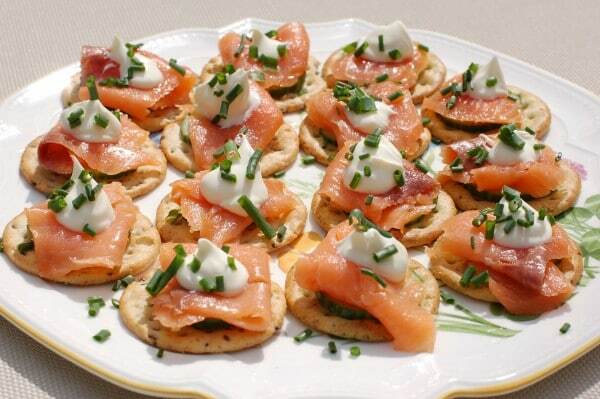 Top each cracker with one cucumber round, 1/2 ounce smoked salmon, and about 1/2 teaspoon of crème fraîche. Sprinkle chives on top and serve. 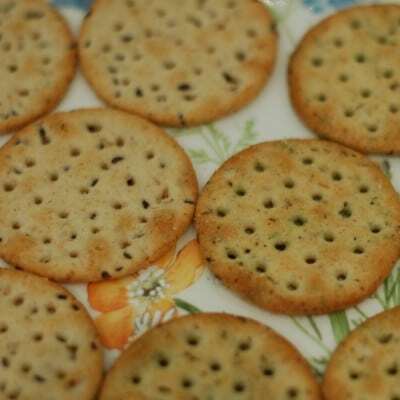 For more recipes using Breton’s gluten free crackers, check out the Recipe ReDuxer posts below. What would you make with Breton Gluten Free Original with Flax or Herb and Garlic crackers? Yum!!! I am imagining my son eating the whole plateful of these crackers with smoked salmon-he loves it! Love how easy and elegant this is-definitely will be making soon! My girls love smoked salmon and ate these up! enjoy! 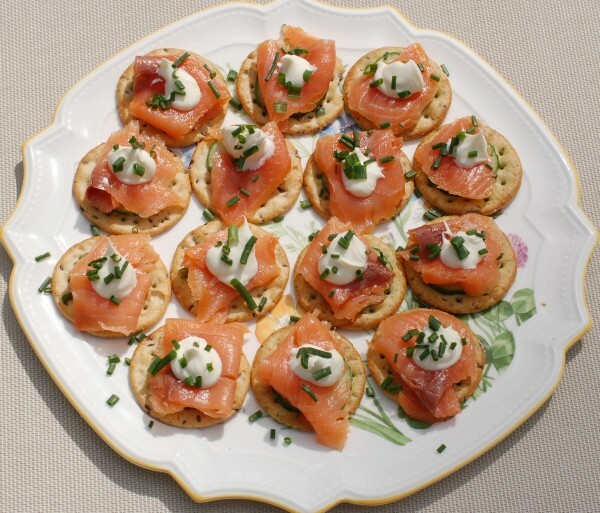 I always serve a smoked salmon dish at gatherings. These look perfect! I love appetizers that look fancy but aren’t too difficult to make. This look great! Me too! Thanks so much Melanie!